Over Christmas and New Year, my sister-in-law went on holiday to New York. She asked us if there was anything we wanted. As a make up lover, my first thought was “OMG, SEPHORA!” and I transferred her some money. We used to have a Sephora at Bluewater in Kent, but that closed years ago. It was an amazing smelling shop with red carpets and I live in hope that one day Sephora will come back to the UK. In the meantime, the products my lovely sister-in-law picked me up will have to tide me over! To my amazement, she picked up everything I asked for (except for one thing that was out of stock) AND surprised me with another palette I’d wanted for my birthday! Anyway, that’s enough teasing. Let’s take a peek! I have loved Kat Von D since watching her with awe in my teens when she was on both Miami Ink and LA Ink. With her alternative style, I was so excited when she released a cosmetics line. This excitement was short lived, though, when I realised it was only going to be available in the U.S. In 2016, I was delighted when Kat Von D Cosmetics began to be sold at Debenhams. However, products sold out incredibly quickly as they were so popular. Not only that, but, even now, not everything is available to us in the UK! 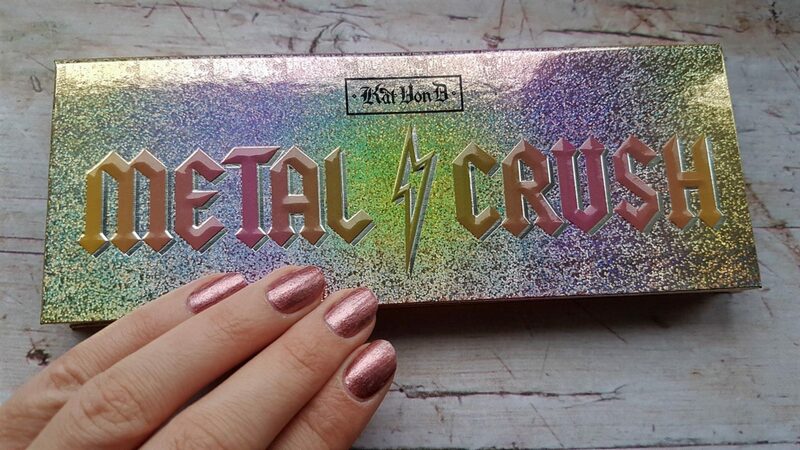 One such product was the Metal Crush palette, although I believe it’s available in the UK now. This is a limited edition palette of highlighters that my sister-in-law bought me for my birthday. It’s not the easiest highlighter to work with, nor the most dramatic. However, I like it all the same. It has three colours, so there is a colour that will work for any look! 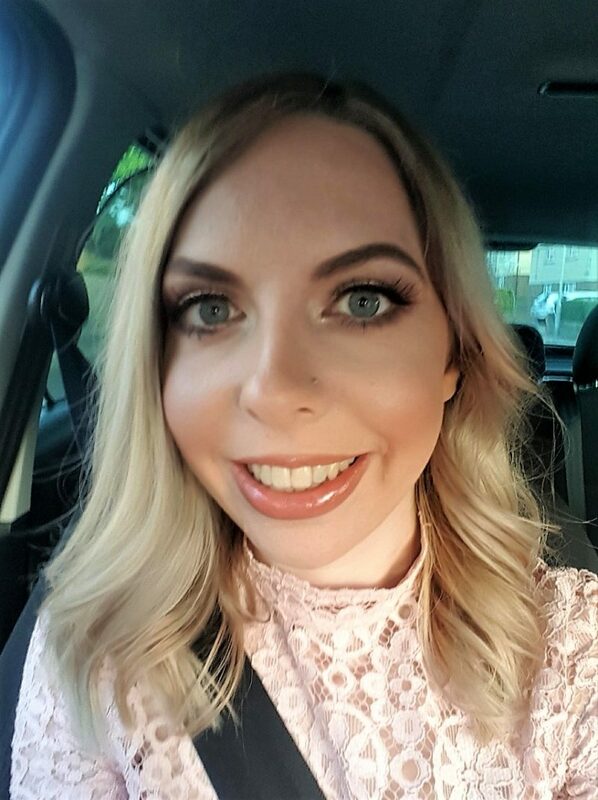 I used the pink for a recent visit to a local pub for a meal and it looked lovely. It probably works better for a night time look as it’s very glittery, but that hasn’t stopped me from using it in the daytime! 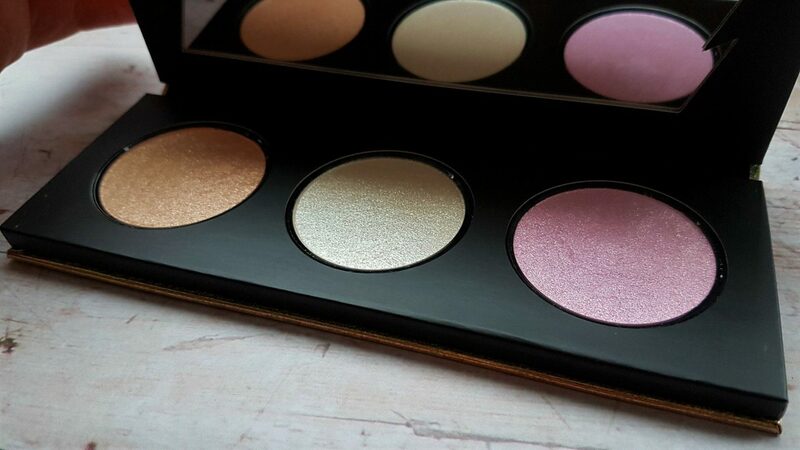 As for this eyeshadow palette, I love the range of colours. 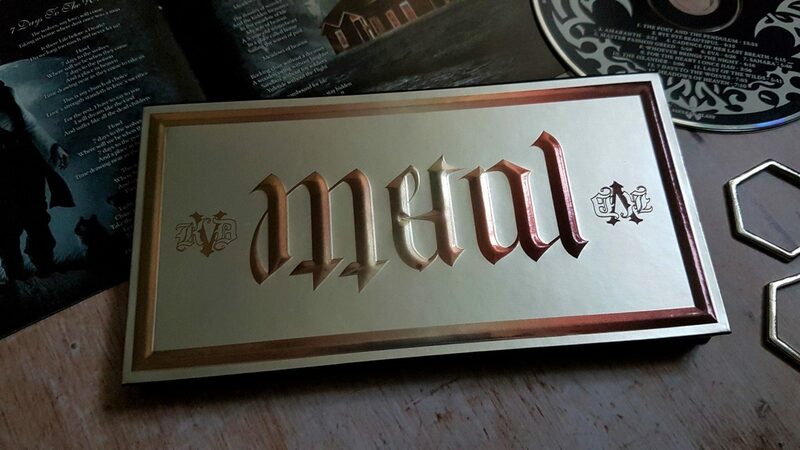 As the name of the palette suggests, it contains a combination of metallic and matte eyeshadows. The pigment of these colours is great and they’re lovely to apply. 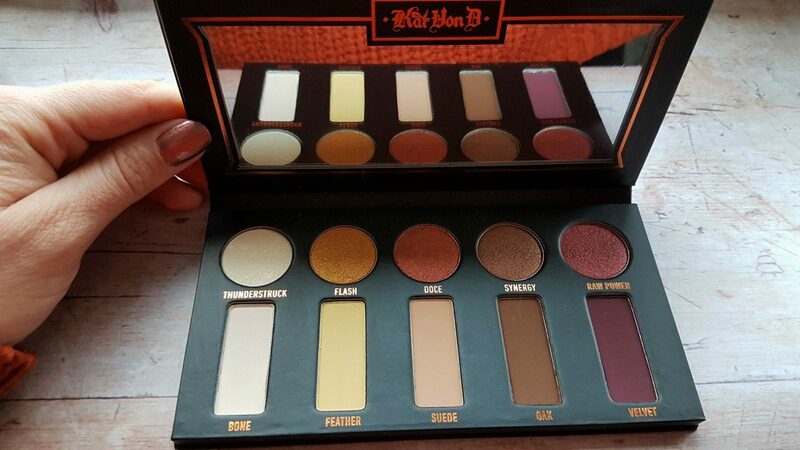 As usual, with Kat Von D’s products, I like the names of them too. My favourite names are Thunderstruck (a nod to AC/DC) and Flash (I suspect this is a nod to Queen). Kat Von D’s taste in music is obviously quite similar to mine! 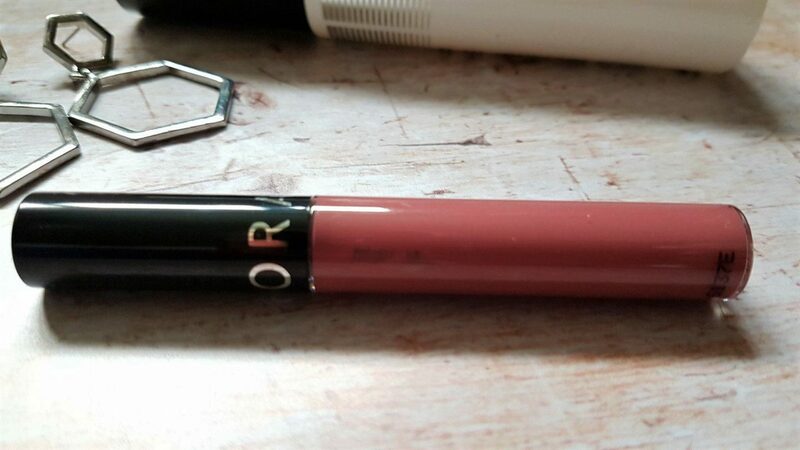 I thought I’d try out one of Sephora’s Cream Lip Stain Liquid Lipsticks as I’d heard they were really good. I chose 13 Marvelous Mauve, as I thought it was a pretty colour but fairly neutral. 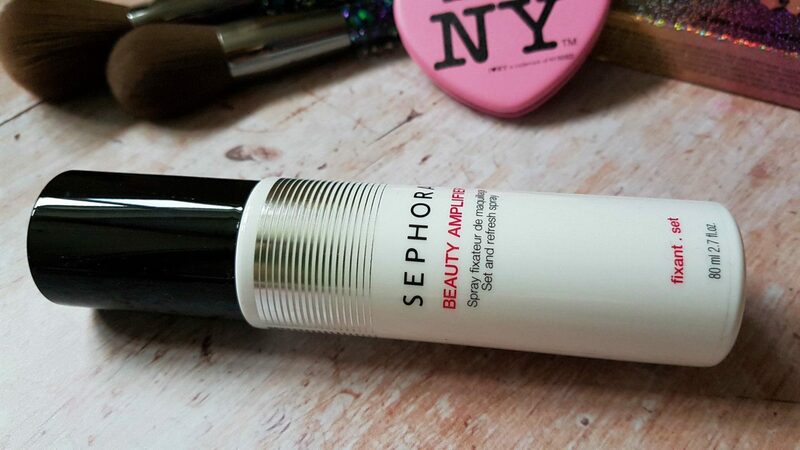 It is very creamy and easy to apply with a slanted wand. It feels lovely on and the colour lasts really well too. Unlike some liquid lipsticks, it isn’t at all sticky, and the avocado oil it contains means it doesn’t dry out your lips. At the moment, I’m mainly switching between this and my Urban Decay Vice palette and will be so upset when it runs out! I’d heard good things about the Beauty Amplifier Set and Refresh Spray. I love how it feels when it’s applied. The peppermint feels so refreshing on your skin! I’m not sure I’ve noticed whether it’s helped my makeup set any better though. I also learned very quickly that you have to be careful how you apply it as I completely ruined my mascara the first time I applied it. Back in December, I was in desperate need of some new brushes! 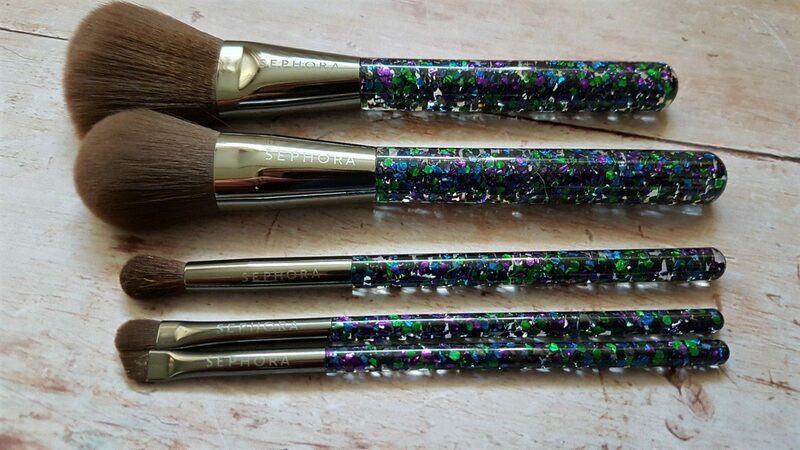 I fell in love with some glittery blue/green/purple ones on the website. I fell in love with them even more in real life as they’re just so pretty! They are so soft too and a pleasure to use. My husband said he’d pay for these as one of my birthday presents from him and I’m so pleased as I wouldn’t have got them otherwise! I love these products and am so grateful for my sister-in-law giving up some of her time and luggage space to bring these back to the UK for me! It’s made me miss Sephora even more though. I’ll just have to keep hoping that they return to our shores!